I usually don't like to stray away from my beloved Estee Lauder Double Wear Foundation, but I've had my eye on trying a new high end foundation and this came in the shape of the Yves Saint Laurent Le Teint Touche Eclat Foundation (which I will refer to as YSL Touche Eclat Foundation in this post). In the UK this foundation is currently available in 17 shades (you can view the full shade range here), which I think is pretty impressive. After visiting the YSL counter and testing out a number of different shades I decided to go with 'B50'. The foundation has a light consistency and provides good light-medium coverage, which is buildable without appearing to look 'cakey' on the skin. When I apply this foundation onto my skin it feels weightless. My favourite thing about this foundation (aside from the amazing packaging) is the subtle glow it gives my skin, which I think is perfect for this time of year. One downside to this foundation is the 'staying power' - it's fine for on an everyday basis where I'm just going to work. However if I wanted it to last any longer I don't think it would quite make the cut as it seems to have worn off towards the end of the working day. l have also noticed that the little bit of scarring I have on my chin does peep through the foundation (which is easily fixed with concealer, but still worth mentioning). This foundation is a little bit spendy, however if you are looking for a foundation which will give you light-medium coverage and a healthy glow then it's definitely one to try (I'd reccomend getting a sample first). 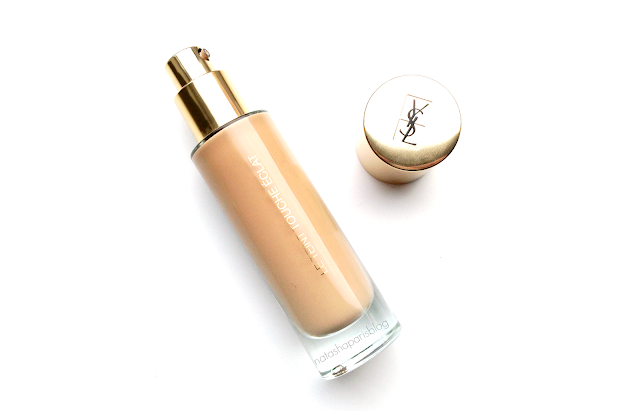 Yves Saint Laurent Le Teint Touche Eclat Foundation (RRP £31.50) is available online and at YSL counters.